Ar.Pe.Pe is one of Italy’s truly great producers. 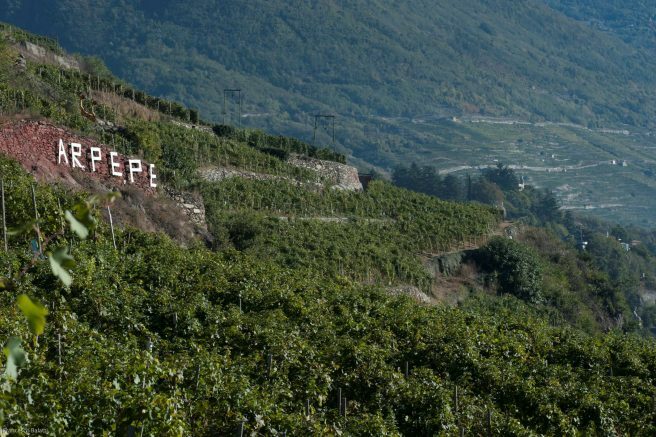 Isabella Pelizzatti Perego’s family have been tending their vines in the alpine Valtellina since the 1860’s. They work only with Nebbiolo, or Chiavennasca as it is called around there, growing grapes at high altitude on mountains so steep the vines seem to cling to their edges. Production is very much of the old school and labour is intense, the hills making it difficult to reach the fruit at all. Everything in the vineyard is done by hand and in the cellar the family exercises a soft touch with great patience. The resulting wines offer a unique expression of this remarkable place. It is with great pleasure that we welcome Isabella back to London for the fourth consecutive year to share the story of her family, their wines and the mountainous vineyards of their native Valtellina. We hope you can join us at one of the following events. On Monday 12th September Isabella will be hosting a Valtellina masterclass at the new Noble Fine Liquor store on Farringdon Road. Guests will learn about the history of this mountainous region and her family’s historic winery while tasting through six classic Ar.Pe.Pe wines. We’ll pour the iconic Rosso di Valtellina from magnum, before moving onto wines from each of their gran crus, a twenty year old wine straight from the family cellars that shows the remarkable ageing potential of great mountain Nebbiolo and finally an old-fashioned sforzato, or late harvest wine. When Isabella came to visit last year she asked us to choose somewhere for lunch. As we often do, we ended up eating at Lyle’s and she was wowed by just how well the delicate nature and subtle details found in her family’s wines paired with chef James Lowe’s food. James himself is a big fan of the Ar.Pe.Pe wines and they have been staples on the list at Lyle’s since they opened. On Tuesday 13th September he’ll be cooking a one-off menu inspired by the wines and featuring dishes like Grouse, Girolles & Mulberries and the wonderful Federia cheese, made here in Britain by Anne Connolly, who spent over a decade in Valtellina learning from local artisans. Isabella will create a special wine list for the night, exploring the wines of Valtellina’s most iconic mountain, Sassella. This is the part of the valley where the terraces are at their steepest and shallowest and the vineyards here producing tense, delicate and often profoundly mineral wines that taste like no other Nebbiolo on earth. There will be wines from their various crus up and down the mountain, from bottles big and small. Rare bottles and older vintages which have been brought over just for the night and of course, their sforzato. In some cases, Isabella was only able to take spare a bottle or two, meaning this may be the only chance you will have to try some of these wines and with everything available by-the-glass, a great opportunity to try some things that may otherwise be out of reach. Isabella will be on hand to guide you through each glass, share stories from the vintages and answer any questions you might have. Tickets are £49 for the menu and must be purchased in advance. Guests are free to explore Isabella’s list via a suggested pairing, or to enjoy the wines by-the-glass or bottle.